The organizers from Beyond Fest recently send us over information for their upcoming film festival. The festival will feature 18 West Coast premieres including Brian Hegeland's masterful LEGEND as opening night film and Hsiao-hsien Hou's breathtaking martial arts ballet THE ASSASSIN, to close. Other hotly-anticipated titles include Kurt Russell's existential western shocker BONE TOMAHAWK, Miike Takeshi's gloriously outrageous YAKUZA APOCALYPSE and Karyn Kusama's terrifying thriller THE INVITATION along with screening of classic films like "Evil Dead", "Dog Day Afternoon" and more. 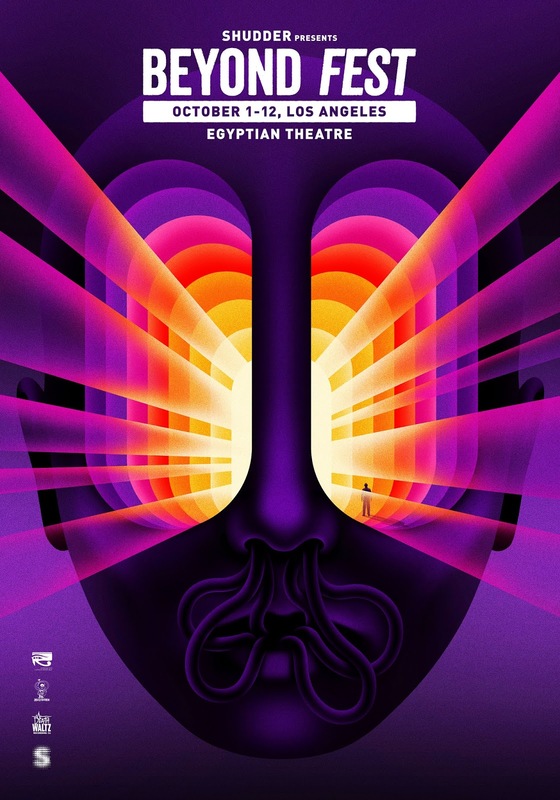 Beyond Fest will be held in Los Angeles from October 1st - 12th at the Egyptian Theatre. Beyond Fest, the highest attended genre film festival in the US, is excited to announce its full slate of 2015 programming featuring 25 events of mind-bending, movie madness. 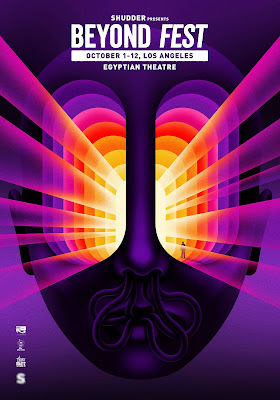 Presented by Shudder, Beyond Fest returns to Hollywood's famed Egyptian Theatre for 11 days of movies, music and mayhem spanning Thursday, October 1st - Monday, October 12th to generate funds for co-presenter, the nonprofit American Cinematheque. With a diverse slate that includes films from all corners of the globe Beyond Fest is proud to present 18 West Coast premieres including Brian Hegeland's masterful LEGEND as opening night film and Hsiao-hsien Hou's breathtaking martial arts ballet THE ASSASSIN, to close. Other hotly-anticipated titles include Kurt Russell's existential western shocker BONE TOMAHAWK, Miike Takeshi's gloriously outrageous YAKUZA APOCALYPSE and Karyn Kusama's terrifying thriller THE INVITATION. "We're just relieved that a film institution as revered as the American Cinematheque let us come back," said Beyond Fest Co-Founder, Christian Parkes. "Last year, guests were whipped, they vomited and snorted snuff en masse, it was bedlam. With this lineup I'm proud to say it's going to be even bigger." Once again, music features prominently in Beyond Fest's charter with some of the most influential and innovative artists participating. Die Antwoord's Ninja will be joined by friends as he hosts a rare 35mm screening of ERASERHEAD for 'A Night of Zef Absurdia.' Punk icon Henry Rollins is celebrated with the West Coast premiere of his existential cannibal shocker HE NEVER DIED. Post screening, Rollins will be joined by director Jason Krawczyk in a wide ranging conversation moderated by agent provocateur Shepard Fairey. Legendary composer Fabio Frizzi is performing in Los Angeles for the first time in his illustrious 40 year career. Complete with his 8-piece orchestra, the Maestro will perform FRIZZI 2 FULCI LIVE: his magnificent musical-opus highlighting his work with Lucio Fulci. FRIZZI 2 FULCI LIVE will also feature a rare screening of the Fulci's gothic masterpiece THE BEYOND uncut, uncensored and in scope on 35mm. The original 1925 version of Lon Chaney's THE PHANTOM OF THE OPERA gets the live score treatment courtesy of his grandson Ron Chaney who is screening the masterpiece on 16mm. The 1925 score has remained in possession of the Chaney family since the film's release and will be performed for one of the first times in 90 years. Ron Chaney will be in attendance to discuss the impact of Cheney's work. Premiering live, synth superstar Steve Moore will perform his score to horror wunderkind Joe Begos' THE MIND'S EYE before the telekinetic shocker receives its hometown throwdown premiere. Moore's performance will be complemented by the release of a limited 7" courtesy of Death Waltz Records, produced exclusively for the screening. "Music has been an integral part of Beyond Fest from the very beginning," said Spencer Hickman, Mondo / Death Waltz Recording Co. Label Head. "The first show we ever booked was Goblin and we're incredibly proud to build on that foundation with this phenomenal and unique line up." Celebrating LA filmmaking remains a priority for Beyond Fest with Karyn Kusama receiving this year's 'LA Spotlight' for her shocking thriller, THE INVITATION. As part of her Spotlight screening, Kusama selected Philip Kaufman's INVASION OF THE BODY SNATCHERS to accompany her film citing its malevolent corresponding elements and themes. LA represents en masse with SOUTHBOUND, a wild and insanely gory reinvention of the horror anthology model from the team behind the V/H/S series. SOUTHBOUND is co-presented with fellow LA-conspirators, Spectrefest, and features a live performance by I Speak Machine for the premiere of their new short, ZOMBIES 1985. Beyond Fest welcomes the horror streaming platform Shudder as its Presenting Sponsor, a partnership that provides 10 screenings (9 West Coast premieres) absolutely free to film fans. Every night, the 100-seat 'Shudder Theatre' will feature a brand new film selected from across the world including a demented Mads Mikkelsen's in Anders Thomas Jensen's unbelievably black comedy, MEN AND CHICKEN, manga favorite / insanely-mental-live-action-madness of ASSASSINATION CLASSROOM, the hyper-violent remake of Mario Bava's Euro-crime nasty, RABID DOGS, the creepy debut shocker from Oz Perkins, FEBRUARY, Majid Al Ansari's electrifying cat and mouse thriller, ZINZANA and the over-the-top martial arts sequel, SPL 2. "These are some of the best and most provocative films of the year," said American Cinematheque and Beyond Fest programmer, Grant Moninger. "That we can provide them completely free of charge is very important to us, we're thankful to Shudder for being a part of our mission to bring great films to the great genre fans of this city."